How did you meet and decide to play together? We formed a quartet so we could participate in the Red Rocks Winter Chamber Music Festival in Arizona. We were all friends with the violist prior to this festival and he is the one who put us all together. What prompted you to devote yourselves to chamber music? Aidan (violin) and Orei (viola) attended and met each other at the Castleman Quartet Program. Erika (violin) participated in the Advance String Quartet Program at Interlochen, and Matt (cello) was a part of the Nevada School of the Arts Honors Quartet for 2 years. Through these many different oppurtunities and experiences we have all individually been able to find a love and passion for chamber music. Do you perform as solos, too? Yes! We all love to perform as soloists as well. We have all had oppurtunities to solo with and/or as a part of respected orchestras including as the Las Vegas Philharmonic, the Las Vegas Academy Philharmonic Orchestra, and the St. Louis Symphony Youth Orchestra. Was there any experience or meeting particulary important for your musical development? We all participated in the Red Rocks Winter Chamber Music Institute. This experience allowed us to work with esteemed professors including Shmuel Ashkenazi, David Ehrlich, Sergiu Schwartz, Thomas Landschoot, and Paul Coletti both as a quartet and individually. We learned and grew so much that week and we are incredibly grateful for that experience that put us all together. How do you decide what repertoire to perform? We debated between lots of different pieces before we decided on playing the Janacek Quartet No. 1. We are all so glad we picked this piece because Janacek has a very unique and, in many ways, obscure style that gave us a lot of room to develope an interpretation all our own. We feel our selection was a great choice for us that allowed us to showcase our strengths and turn some of our weaknesses into strengths, as well. Are there styles or composers that you all find especially suitable to your ensemble? Why? We all think that late romantic repertiore was a great style choice for us, especially with the Janacek Quartet, because it pushed us to our limits and allowed us to really work together due to the intricacies of the voices. Are there any new compositions on which you are presently working? We all live in Las Vegas except for Aidan (violin) who lives in St. Louis, so all of us “Vegas players” are planning to start a trio in the near future. However, we all really wish we all lived together so that we could continue our work as the “Vegas Quartet” because we really enjoyed the short time we had together and have tons more quartet repertoire we would love to work on. Playing together involves discussing, confronting... how do you go about it? We are all great friends so we found that this came very easily for us. We’re all very picky but because we all respect each other as individuals and as musicians, and geniunely enjoy spending time together, we got to have lots of fun during our rehearsals and got a lot done as well. How often do you rehearse together? The week we spent as a quartet during the Red Rocks Festival was so amazing. We rehearsed as a group about 5 hours a day. We all had such a love for the piece and spent what seemed like all of our time on it. But we found that some of our best growth as an ensemble came from the fact that we spent all of our time together. We lived together, ate all our meals together, listened to music together, we’d even spend our nights playing scategories together! We think that this helped us get a stronger sense of ensemble in just the short time we had together. In your opinion, what is your strength in your playing? I think one of our strengths as an ensemble comes from the fact that we have different strengths. Aidan is especially great at being able to achieve many different colors which is a real benefit to the Janacek. Erika strength was being able to catch on quickly to the many different elements that Janacek uses and in being able to understand and copy the musical ideas of the other quartet players. A great strength of Orei’s is his understanding of the piece and music in general. Matt was a real asset to the group and in holding the group together rhythmically and always having his ears open to what’s going on in the piece. Aidan really enjoys cooking and being a foodie. Erika’s hobbies include working as a model and with her service organization which provides concerts for seniors, specifically those with Alzheimers. Orei enjoys music and is always listening to music no matter what he’s doing. Some of Matt’s hobbies are rock climbing and slack lining. 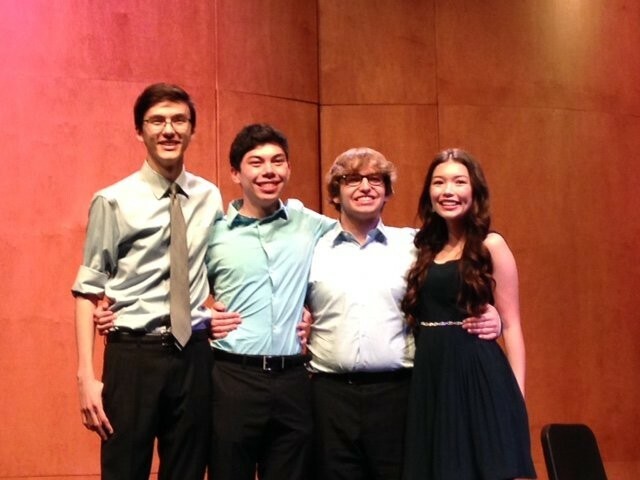 We all plan to pursue music in college/conservatory and would love to see us working together as a quartet again in the future.